Posted on September 26, 2016 at 9:09 pm. I completed the WordPress PD. 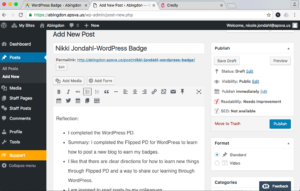 Summary: I completed the Flipped PD for WordPress to learn how to post a new blog to earn my badges. I like that there are clear directions for how to learn new things through Flipped PD and a way to share our learning through WordPress. I am inspired to read posts by my colleagues. I wish I could have attended the Tech Tuesday to learn this in person with others. I wonder what new things I’ll learn through reading other people’s blogs. In the future I hope to attend Tech Tuesdays to learn with others.